Markets evolve. That’s always been true but investors tend to forget that important lesson when a new market seems to create opportunities that aren’t based on the same set of rules as other markets. That’s what happened with cryptocurrencies. Markets for bitcoin and alternative currencies developed quickly. Cryptos, as they are called, are a revolutionary technology and they could potentially change the face of commerce. This is new and exciting and some investors rushed in. Prices soared as new investors entered the market. And, then, prices collapsed. In hindsight, it all seems inevitable. The price rise was steep and it showed signs of a bubble. The collapse of a bubble is inevitable. And, now, investors are avoiding the market, concerned about further declines. It all seems unprecedented, but, of course, it is not unprecedented. Market historians have seen this pattern before. “The British Railway Mania of the 1840s was by many measures the greatest technology mania in history, and its collapse was one of the greatest financial crashes. It has attracted surprisingly little scholarly interest. In particular, it has not been noted that it provides a convincing demonstration of market inefficiency. There were trustworthy quantitative measures to show investors (who included Charles Darwin, John Stuart Mill, and the Bronte sisters) that there would not be enough demand for railway transport to provide the expected revenues and profits. 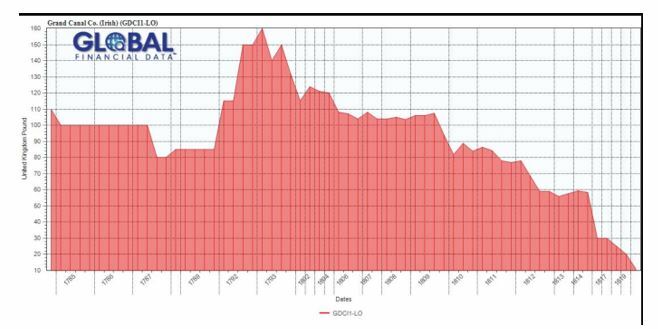 Those are the opening lines of his paper, “Collective hallucinations and inefficient markets: The British Railway Mania of the 1840s.” The chart below, also from that paper shows the hallmark of both a new technology bubble and the financial bubble that accompanies the mania. Investment in the technology comes first. Then, some time after that, investment in the financial markets becomes exuberant. Investors realize that the technology is a game changer and commerce will be forever changed. In this case, it was railroads, an afterthought to the modern investor. But, in 1830, the new technology was connecting cities and shrinking travel times like never before. Farmers would be able to sell their products in distant markets and manufacturers were able to locate where it made sense to. No one would be limited by geography anymore. It was, perhaps, the greatest revolution in technology since the canal bubble that had unfolded at the beginning of the century. Bubbles have formed since at least the 1600s and they have also occurred in more recent times. The Internet bubble of the late 1990s is an example of a technology bubble that followed the same pattern as canals and railroads. So is the subprime mortgage bubble that led to the collapse of the global credit markets in 2008. Investors create these bubbles time and time again. They seem to forget the lessons of the past as they get caught up in irrational exuberance only to suffer the same fate at the end of the bubble as they have in all of the previous occurrences. But, the popping of the bubble isn’t always the end of the story. In hindsight, it often turns out that the exuberance was justified. Railroads and canals did change commerce. So did the Internet and so did subprime mortgages. But, it wasn’t always the first mover that changed commerce. New markets always include companies that will make mistakes. They always include investors that will make mistakes. The collapse that follows the bubble is a shakeout. It can be thought of as the creative destruction that the Austrian school economist Joseph Schumpeter considered to be vital to a growing economy. Some companies will survive the process. A recent example is Amazon.com. A logarithmic scale is used in the next chart to show the decline in the stock. A log chart shows percentage changes as equal on the vertical axis of the chart. Amazon has gained more than 65,000% since it began trading. But, enjoying that gain meant sitting through a 93% decline in value as the internet bubble collapsed. Investors who bought the top would wait until 2007 to break even. They then promptly endured another decline of 55% after that. Like canals, railroads and internet companies, cryptos have the potential to change the way business is conducted. They could create new opportunities for businesses and they could deliver outstanding returns in the long run. And, they are following the same pattern seen in each of those previous technologies. The infrastructure for crypto was built up over the past decade. Then, investors jumped into the market while it was still immature. Their demand pushed prices up quickly, at a faster pace than was warranted by the technology. The crash was inevitable and it was part of a maturation process. Now, there is a shakeout and there are likely to be a large number of losses. There are also likely to be some large winners, the Amazons of the crypto world, if you will. It will take time and research to find these winners but it will be worth the trouble if history is a guide. And, as successful investors know, history is in fact a profitable guide to the present.